Printed in the U Matuna, newspaper for the Archdiocese of Hagatna, Guam, on November 13, 2011. 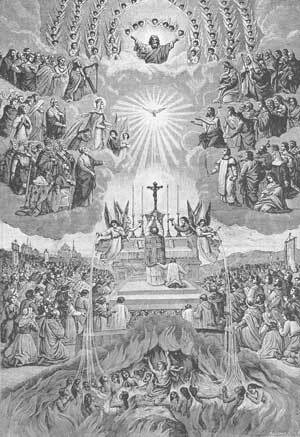 As mentioned in a previous column, the entire month of November is dedicated to the memory of the Poor Souls in Purgatory, so we will take this occasion to speak of Purgatory a bit more. Disagreement about Purgatory is at the root of the Protestant Reformation, and remains a critical issue of division between Catholics and non-Catholic Christians. Martin Luther essentially claimed that Purgatory did not exist because it could not be proved from the Bible, and the challenge to prove Purgatory from Scripture is still a challenge that confronts Catholics today. While Catholicism is not a “Bible-Only” religion, and we do not require that everything we believe be explicitly stated in Scripture, most of what we believe is in fact very explicit in Scripture, including Purgatory. First, let’s look at a few scriptures where the concept of Purgatory is implicit, and why Luther and Protestantism reject them as evidence of Purgatory. In its short entry on Purgatory, the Catechism employs the support of Matthew 12:31 and 2 Maccabees 12:46. In the Matthew passage, Christ warns that sins against the Holy Spirit will not be forgiven “in this age or the age to come.” The implication is a time or state (age) after death when sin might still be forgiven. However, non-Catholics and even some Catholic scholars dismiss the reference to this “age to come” as evidence of Purgatory since even if Purgatory does exist, sin must be repented for in this life. There is no second chance. Scholars believe that Christ was rather emphasizing the gravity of a sin against the Holy Spirit. 2 Maccabees recounts the request of Judas Maccabeus to pray for the souls of his fallen men “that their sin (idolatry) might be blotted out”. Because prayer is not needed for souls in Heaven and is of no use to those in Hell, it appears that at least some Jews believed in an intermediate state. However, 2 Maccabees was one of the seven books Luther discarded from the Old Testament, so the passage is useless in an apologetic endeavor with a non-Catholic. The Catechism also references 1 Cor 3:15; 1 Pet 1:7, and Job 1:5. Let us take a look at these. Both Corinthians and Peter refer to a purifying fire. However, both scriptures are metaphoric and do not explicitly support the post-death state of purgation Luther and Protestant challengers require. The passage from Job shows Job offering sacrifice for his children, but since his children are living, it rather supports the idea of intercession on behalf of the living but not necessarily the dead. There are several other scriptures where a post-death state of purification is implied: Mt. 5:26, Lk 12:47, and Lk 16:19, to name a few; but these are parables and normally not accepted as proofs. And the “prison” mentioned in 1 Peter 3:19, where the souls of the righteous dead went to await the Savior, is a “third place” that Protestants already accept but believe there was no more need for it after Christ died, rose, and ascended into Heaven. Here, at the end of time, we see “Death and Hades” as a place that is not Heaven and not Hell. We know it’s not Hell because after giving up “their dead”, Death and Hades is “thrown into the pool of fire”, which IS Hell. Hell can’t be thrown into Hell so Death and Hades is a third place, and what’s more, Scripture tells us there are souls detained there. We know that these souls are not damned because the damned go immediately to Hell upon death and judgement. There is no holding place for them. But they are obviously not in Heaven either. So where are they? They are in a third place. 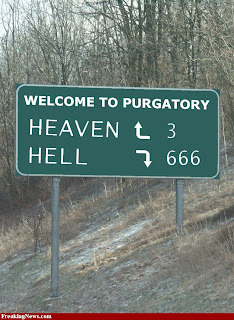 And the only reason they could be there is that they are not deserving of Hell but not yet pure enough to enter Heaven. (“Nothing unclean shall enter it” - Revelations 21:27). The Church just gives a name to this “place”, a name relative to the nature of its purpose: to purge. For some reason, Revelations 20:13-14 never seems to pop up in apologetic writings about Purgatory. However, it is the only place in Scripture, despite the highly symbolic nature of Revelation, where a post-Resurrection, “third place”, is explicitly referenced, and wherein souls of the dead are detained. I hear that Catholics and Protestants are both there.